In the hospital, it turns out that there are a lot of little symbols of status or culture. Take for example the lab coat. A early 20th century icon of smarts that has somehow hung on well past it’s usefulness – at least the layman’s perception of that usefulness (although I suppose that there is a place for it in a laboratory while actively participating in some research). Honestly, there are not a lot of people sporting these overgrown pocket protectors, but it is interesting to observe the individuals that walk the halls of the hospital with them on – and there are these odd groups of coats that wander together: talking and walking at high speed without ever stopping. Nobody knows exactly who they are or what they do, or for that matter if they are even real. I can’t figure out if they are just geeky types that don’t care what people think, or people who care way too much what others think. This post originally was going to just be about the lanyard – and we’ll still get there – but I have to make one more stop on the way to that discussion with a brief note about shoes that the staff wears: Danskos – with a random pair of Sketchers walking about. Clearly they are the most comfortable shoes to do this job in and there are no qualms with it; but if I could make a recommendation to the suits at Dansko, it would be to open employee shops at major hospitals – you’ll make a mint. Finally on to the lanyards. These things started out as a way to display your employer issued ID cards and soon added security passes, calendars, fact cards, info cards, etc. Then at some point, someone realized that they weren’t just for displaying those things…they were for proudly displaying those things…and they could make a business out of helping people become proud. There are all sorts of these affectionate displays including your alumnus or the college that you cheer for, professional sports teams, ski areas, medical equipment companies, units in the hospital, etc. I can’t blame people for finding places to express their individuality within the world of hospital scrubs and lab coats; but it does make you want to go up to some of these folks and ask what they’re trying to say. I thought about creating one that would say “This Is Just A Lanyard” – but then I realized that would be just the same as all the rest. PS – I haven’t seen a single one of the NICU staff (doctors or nurses) wearing either the lab coats or the lanyards. One more note: I tried to find someone that was sporting the trifecta of fashion discussed above for a photo for the blog – and that might be the most elusive of all. This made me laugh so hard! It’s amazing to hear another’s perspective for what some see as “normal”. BTW- My Dansko’s are solid black and my lanyard is blue and says Denver Health with pins on it for longevity, awards, etc. I’ve seen the trifecta of fashion at DH-if you want a pic, I can probably arrange it! We think of you guys often and pray for you. I saw Ezra today at the Rec Center while we were there for Ryan’s swimming lessons. I can’t believe how big he is! He’s an amazing little boy-credit to you both! Ha ha ha…great post! I am going to have to ask my sister if she is guilty of the lanyard or white coat. (I already know she loves her danskos.) Do you think it is the equivalent of “flair”…lanyards for silly buttons? 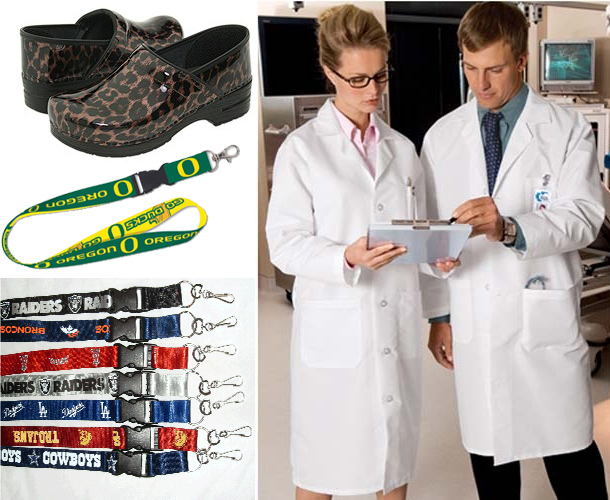 Alissa wears a lab coat, Danscos, and a lanyard. I don’t know what to say.